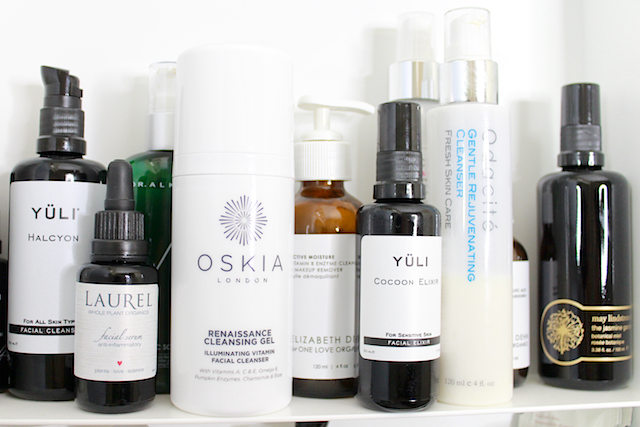 This one above is a raw shot of what my skincare cabinet looks like at the moment, (and a pretty mean one of myself with no makeup on, too!) No editing nor cleaning up. The only thing I did before taking the photo was turning the products so they would face the front and you could see the labels, but that is about it. I was asked to write a more in depth Fall Skin Care Routine post, but I could not call it Fall Routine, because here in Florida is pretty much, still Summer. 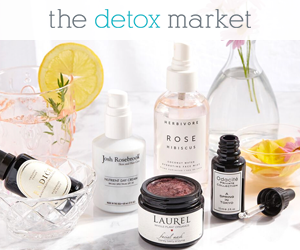 No need for rich moisturizers, but instead good cleansers, hydrating/balancing mists, and repairing serums. I did switch a few products over the past few weeks because I ran out of some of them and I also got a few new ones in. As you probably expected, I did not wait to finish any of my cleansers before opening the Oskia Renaissance Cleansing Gel that I got two weeks ago from Cult Beauty. I plan to use it a little longer before writing a full-review, but so far I am enjoying it very much. The texture is terrific. It goes on like a pink gel/balm, which is lovely for massaging my face. I apply it on dry skin, quickly begin to massage my face, then I add a little water and the gel/balm turns into a milk. It feels like a quick chemistry experiment is happening on my face. Very cool. It cleanses well, it is conditioning, and is easy to take off with a soft face towel. Of all the other cleansers that I keep in my cabinet I am still using the Odacité Gentle Rejuvenating Cleanser, which is still a favorite. I am using Oskia in the morning and Odacité in the evening after I remove my makeup with the ED4OLO Cleansing Oil. I am very, very happy with these three cleansing products and highly recommend all of them for any skin type. I think that I will stick with these for a while (I really mean it). After cleansing, I always use a toner to balance and put some moisture back into the skin. I just started a new bottle of YULI Cocoon Facial Elixir (a godsend), but I just received the May Lindstrom Jasmine Garden Mist* two days ago and oh-my-gosh, it smells dreamy! It is sweet, it is floral , it is gorgeous: it is so May Lindstrom! I Do not know how else I can explain it. It’s a treat. I cannot talk about skin benefits yet, but it smells amazing and it feels lovely on the skin. I will report about it in a few weeks. I also have a bunch of other toners that I use on and off, (depending on what my skin is looking like) and I will definitely feature them in upcoming Tuesday Toner posts. As for moisturizers, I use different products for daytime and nighttime. In the morning, I usually reach for a water-based moisturizer like the MV Skincare Oxygen Moisturizer, which I am almost out of and I will definitely repurchase. It’s great for my skin because it has more of a matte finish, so it does not make my skin more shiny like some water-based moisturizers do. Around my eyes, I use the Pai Echium and Argan Gentle Eye Cream, which I keep in the fridge. It is very light, it absorbs well and moisturizes the eye area without leaving it greasy and without irritating my eyes (I wear contacts, so that is important to me). Some days, especially when I am going to spend most of the time outdoors, I use the Dr. Alkaitis Organic Soothing Gel so that if I sweat much the gel will help prevent breakouts. Whenever I want a little extra softness or I am going to spend the day at home, I reach for Kahina’s Argan Oil. In the evening, I have been using a few new serums. The first one is the Pai Age Confidence Facial Oil*. I was recommended to use this serum only a few times a week because it is very rich and more suited for dry and mature skin types. However, as I began to use it, I noticed that my skin looked clear and plump (rich oils often break me out, but this one did not). The other serum that I have recently started to use is the Laurel Whole Plant Organics Anti-Inflammatory Serum*, which is suited for sensitive skin types. I will need to use it a little longer to make up my mind about it, but so far, I am enjoying it. Around my eyes, I usually apply the MUN Serum* or another Prickly Pear Seed Oil. I am currently using a few of my HG lip products. 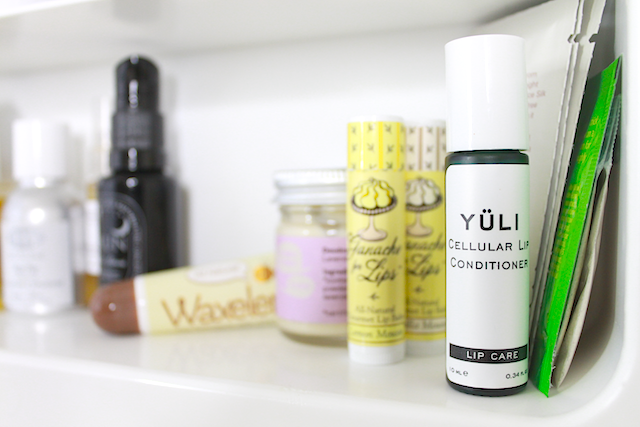 The YULI Cellular Lip Conditioner is a lip treatment, not a lip balm. When I am at home I like to apply it frequently (any time that I remember) because it has ingredients that work great for protecting and renewing my lips. At night, I usually apply a little YULI Lip Conditioner and also Waxelene on top, to seal in the YULI product. Some days I use only Waxelene, which is great at healing chapped lips. I also like the Ganache For Lips Lip Balms. They smell fantastic and are completely matte, so they go nicely under lipsticks. I use the Dr. Hauschka Lip Balm to take off my lipstick and soften the lips. I just scoop a tiny amount with a cotton bud and remove the makeup off my lips (rubbing the cotton bud against my lips gently exfoliates the lips while moisturizing them). 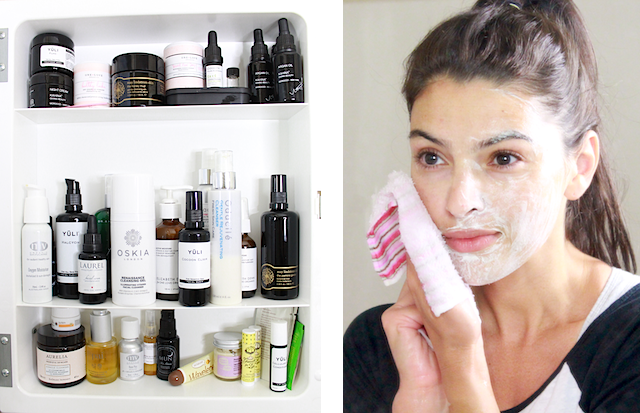 A few times a week Every other day I pamper myself with a face mask and a nice face massage. I have little YULI Pure Mask left, and while it is certainly a repurchase I have been sampling other masks as well (mostly the little samples I pick up at the Spirit Beauty Lounge checkout before finalizing my orders). I was pleasantly surprised at how much I enjoyed the Tata Harper Resurfacing Mask, because my skin did not agree with a few other samples that I tried from Tata (one of the moisturizers broke me out), so I may pick a full-size of the Resurfacing Mask next. If you have any questions about the products on the shelf that I have not mentioned, feel free to leave a comment below. Which products are currently on your top shelf?